I have a confession to make. I used to have an EPIC TILT problem. In fact, here’s a short highlight reel of the most entertaining (and costly) moments from my tilting career. After bubbling a $5 satellite to a $50 MTT in college (baller status), I angrily sprinted onto the porch and chucked my brand new iPhone into a pool 50 yards away. IT WAS THE PHONE’S FAULT! Getting stacked by aggro maniacs. Often the first step in a player’s development is learning how to filet the schools of passive fish that frequent the low/micro stakes tables. You can become a consistent winner pretty quickly by feeding off these straightforward players, but typically I’ve found one of the biggest obstacles to players moving up in stakes is their ability to combat the aggressiveness of midstakes+ games. Realistically, aggressive players are just as easy to beat if you know what to look for – you just have to gain some experience and success against them. 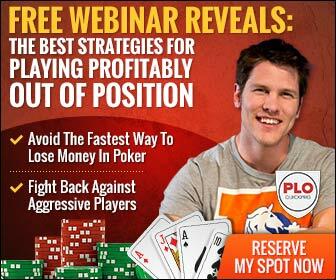 That’s why I recorded this short video outlining a few tips you can use in your next session to profit off of maniacs in both live and online play. Why you don’t always want direct position on the maniac – can you think of why? I love creating these short videos for you – but I want to hammer on the topics you want to hear about. So drop a comment below with any requests you have (consider me your PLO DJ!). 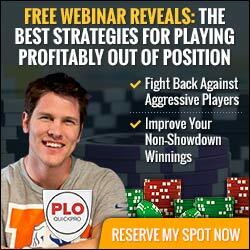 My goal this year is to connect with as many players who are as passionate about PLO as I am – is that you? 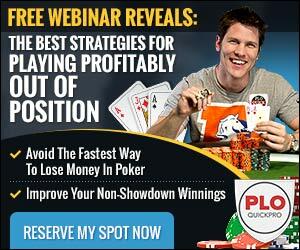 I look forward to helping you achieve your goals in PLO.